"Simply make a layout all about cookies! You can do a layout that includes a photo of a bag of flour and your favorite cookie recipe. A layout that includes a favorite photo of your Grandmother and a journal that includes a favorite memory about baking cookies with her while you were a child. Memories of putting milk and cookies out for Santa. Take the easy way out and run to the kitchen and snap a photo of those Oreos that are in your kitchen cabinet. After all, they just may be your favorite cookies. Now remember, you are not limited to these ideas. This is your layout. Make it your own. Post your layout (one made specifically for this challenge and not previously posted anywhere before now) right here in the Fiskateer gallery and leave a link to your layout here in your comments. Although it’s not a requirement, be sure to leave a list of Fiskars tools you used in making your layout too! Now I’m going to be totally honest with you. I just thought up this challenge within the last hour and created my cookie example to kick things off. And since this is a on-line Fiskateer Holiday Party, I’m going to take on the challenge too! 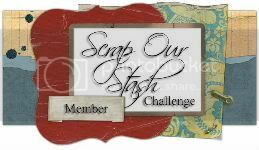 I’m going to create my layout this weekend and post it tomorrow, Sunday 12/14 at 9:00 pm Eastern time along with the name of the random winner of this fun and yummy challenge." So you ask how did I use my Sister-in-law, well do you see the chef in the layout below? Well I didn't have any pictures of myself, so what the heck, we kind of look-a-like, NOT, so I decided to use her picture on my favorite receipe cookie layout! How fun was this challenge! Yes I did spend almost all weekend on this computer playing with other crafters! One of my friends use a vanilla cake mix, 1/3 cup of oil, 2 eggs and plenty of chocolate chips and she thought she was cheating!!!! LOL!! This mostly makes me want to eat some cookies. You can make them with cake mix?! Is that good? oh give us a cookie !